Blockupy emerged for the first time in 2012. In the context of a wave of movements across Europe and North America that occupied the squares and demanded real democracy and social rights, we called for action days in Frankfurt am Main in spring 2012 under the slogan “Resistance in the Heart of the European Crisis Regime”. Frankfurt am Main – an international seat of finance with a downtown area characterized by banks and with the ECB in the center of it all – is a highly symbolic and powerful center of the crisis regime. A regime, that even in Germany called for a break with the ordinariness of crisis management and the “Black Zero”2. A regime that called for stepping into the arrogance of power and the de-democratization of politics – even without popular mass movements like in Spain, Portugal and Greece. “Frankfurt” and the “ECB” were a choice that – as we quickly learned – was “understood” internationally and domestically. The choice of the city as well as the attempt – as a collective of various movements and parties, local groups and civic organizations – to bring together various forms of action in a joint protest, were also understood by local politics. That started actually already in the first year when all actions and days of action were banned and severe limitations were put in place by regulatory agencies. Whether it was that Frankfurt was declared in May of 2012 as an assembly-free zone or, that in 2013, they tried to split the movement – the coming- together of so many – by kettling 1.000 protestors for nine hours. Their goal was to thwart the large-scale demonstration. However, that strategy was not successful. Blockupy became the label for solidarity and re- sistance against austerity and authoritarian crisis management. Blockupy has also become a transnational, Europe-wide point of reference for the fact that, even in the center of the crisis regime, resistance and soli- darity are still possible. “They want capitalism without democracy, we want democracy without capitalism” – a slogan that, beyond the tight activist core, would become evident for a resistance against a “market- compliant democracy” (Merkel). Over the past years, we have had many discussions in different places and various constellations. Moreover, we have continued repeatedly to deal with Blockupy and its political role in an honest and responsible man- ner. Hence, we are using the September weekend as an occasion to look more carefully at Blockupy, its role, possibilities and limitations within the current political context. How did Blockupy come about and how has its impact unfolded? What has changed and what do these political changes – from our perspective – have to do with the September weekend? More precisely: What on that weekend, according to our estimations, worked and what did not? Moreover, most importantly: What does it mean for a politics of intervention and disobedient alliances in the near future? The following paper is the attempt to undertake an essential review, which we owe you and ourselves. Even if the paper indeed got longer again and still doesn’t ask all the questions, let alone answer them, we think it can serve as a stimulating read for a necessary discussion. We think there is much here that can be valuable for us, for you, for others, and for the future. In 2015 the Blockupy mobilizations, as well as the Europe-wide struggles against the authoritarian crisis man- agement of the Troika (and its major source of inspiration, the German federal government), reached a cli- max. With the election of a left-wing government in Greece in January 2015, the (extortionist) policies of European institutions escalated daily. In this situation, the opening celebrations for the new ECB building in Frankfurt on March 18 in 2015 were able to become the focal point for a Europe of joint struggle, a Europe of solidarity, and a Europe from below. And precisely because then the struggle between the Troika (and the German federal government in particular) and the popular protests, where hundreds of thousands of people took the streets every day, had come to a head in and around Greece, it was self-evident for Blockupy, after March 18th, to remain part of this conflict and to defend a cross-border solidarity against the cynicism of the German debate (“Blockupy goes Athens”). Within Blockupy, we do have different assessments of Syriza’s politics and the OXI, of #thisisacoup and the consequential extortion. Yet, as part of the European anti-austerity and democracy movement, the grave result from July 2015 did and could not allow us to remain unaffected. The events in the summer of 2015 were thus for us, as Blockupy, an incision: The movements, the progressive and leftist forces in Europe from the summer, came off rather fragmented, fractured, and estranged. Though it was a collective defeat, it was experienced (and interpreted) rather differently. At the same time, in that very summer – the so-called summer of migration – a new dynamic began. Hundreds of thousands of people from those regions of the world ravaged by war and poverty made their way towards Europe (and were able to reach Europe through Greece, the eastern Mediterranean route, as the life-threatening pushbacks on the open sea were suspended). They brought, even if mostly unintended, the catastrophic state of the world right to our doorsteps and into the public consciousness. Many all across Europe (yes, even in oft-forgotten Eastern Europe), reacted in solidarity in the face of planned government failure all over: They welcomed refugees, performed daily acts of support, plugged the holes left over by decades of neoliberal restructuring of social infrastructures, and took to the streets against right-wing violence, racism, and nationalism. Yet, in the last 12 months, another political and social dynamic became visible: racist anger has become equally part of daily life. Organized by right-wing forces, it has taken up more space in public discourse, and racist violence has increased significantly. A palpable and audible right-wing movement has emerged in soci- ety, supported by the political discourse and the practices of the “centrist” parties (e.g. in the proactive tight- ening of asylum legislation, etc.). And this functioned in a way a sounding board for a multitude of other dissatisfactions, discontents, and experienced powerlessness in the face of the neoliberal “precarization of life” that is deeply tied to a diminishing of solidarity. We must note: currently, progressive, leftist, alternative societal models barely have a voice. The discourse has moved to the right. Even if the (left) “Euro crisis” critiques of the EU, the Troika and German government did not have majority appeal within the intensification, they were still present in public space – alternatives were conceivable. Yet, racism, nationalism, and religious fundamentalism have made it clear: The sleep of solidarity in the shadows of market-compliant democracy gives birth to monsters. “We” – even if only rarely with the name Blockupy or else as an alliance – were also in motion within the mélange of the past months: we supported refugees and stood against Nazis and racists, we protested the tightening of the asylum law, or we went to the borders with our international comrades. Even early on we had already founded local as well as nationwide alliances for social rights for all and mounted networks of initiatives. A few questions have emerged within the (Blockupy) alliance through the exploratory movements and ac- tions of these 15 months: What does this situation mean for Blockupy? How do we understand this societal dynamic? How can this be understood in relation to our fights against austerity and the EU crisis regime, against impoverishment and the emptying of democracy, and for solidarity and a Europe (world) without borders? What is our task as Blockupy? How and where can we connect various political conditions and do politics in such a way as to enable other societal dynamics to emerge? terrain of our struggles, which had developed as a political actor with strong, collective points of reference within the context of the (Euro) crisis, has been increasingly dissolving. This has also changed the possibilities for Blockupy, since one of our core concerns was to create a European actor that wanted to make cross- border solidarity visible, even in “the belly of the beast”. The other change became evident over the past 1 1⁄2 year in the German “movement dynamic”: The “Sum- mer of Migration,” and the subsequent long autumn of reactions, necessitated the reorientation of the im- mediate activism’s work. It was not only necessary to strengthen the “welcome culture” as a concrete “arrival practice”, but to also clearly oppose right-wing populists and Nazis in many places and to not allow them to act unopposed in public space. The tightening of laws taking place at a staccato pace needed strong opposi- tion. The permanent pressure to act also characterized the political work at Blockupy and Blockupy Interna- tional. In retrospect, we have to realize that only few new connections between issues and movements were made. Actually, in many respects, we are dealing with a “return” to “single issue-politics”. Important sub- stantial and organic points of connection got lost. The mobilizations and actions also seemed to lag behind expectations; we felt a powerlessness in the left. This was not because of the topic, but perhaps the way we as well as others approached it. 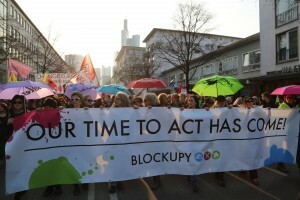 Blockupy stands for the attempt to connect, the attempt to strengthen (social) struggles from below, and to “lend a voice” through symbolic action. Without the certainty of answering these demands correctly, we were sure, however, in spring 2016 of asking the right questions. Wasn’t it so that the “social question,” which was decisive in our struggles against the crisis regime, was being posed here again – just in another constellation? Was not the focus in spring to clearly oppose the right, to make another society visible, and simultaneously to “not leave the social question to the right”? This is why we accepted the invitation from the (German) alliance “Aufstehen gegen Rassismus” (lit. Stand up against racism) in early summer 2016 to take part in their nationwide demonstration and to call for an own day of action on the day before the demonstration. A nationwide weekend against the right in the Ger- man capital did seem like the appropriate moment to toss questions on the split from above and the cross- border solidarity from below prominently into the debate. The dynamic of the alliance/call did seem suited to the creation of a cross-thematic political event. An event, which, in its breadth and compatibility, could raise the “social question” as the breeding ground for right-wing populism. We called for a blockade of the Ministry of Labor and Social Affairs for the morning of September 2. This was not a coincidence. Minister Nahles had announced in early summer that EU citizens – “crisis migrants” – would be excluded from Hartz IV and social welfare (see also http://blockupy.org/en/6514/when-if-not-now-who- if-not-us-boundless-democracy-from-below-instead-of-national-division-from-above/ or http://block- upy.org/en/6596/letter-to-our-friends-and-comrades/). These kinds of legislative proposals, however, are the breeding ground for the debate on the division and split of those at the bottom. For this reason we wanted to link and make visible the various lines being drawn from above: The permanent “under-division” (that is; the permanent undercutting of the lowest social classes through new laws) of the domestic labor market, the permanent separation into those who have little and those who have even less (hello to the Hartz welfare laws) are the breeding ground for racist and social resentments. The movements in France against the Loi Travail were thus also an inspiration to us (see also http://blockupy.org/en/6511/from-paris- to-europe-lets-unite-the-struggles/). We felt this was a point where we could connect the conflicts of various social groups against precarity with the social demands of precarious living and thereby set an example. On the morning of September 2 around a thousand activists tried to block the start of the working day at the Labor Ministry – along the lines that no work is in this case the best work. The massive police presence and the relatively small number of activists meant that many were harmed and around 50 activists were taken into custody. Nevertheless, several hundred made it to various positions outside the ministry to carry the message. The determination of many activists, despite police violence, was great. Admittedly, the number of participants was still below our expectations. Nevertheless, despite low numbers, we were able to bring parts of Berlin-Mitte to a standstill on a workday and many participants took self-empowering experiences home with them. In the afternoon, various actions within the context of the so-called second wave took place. Actions that combined the question of social rights and the drawing of interior and exterior borders in various ways. This second wave revealed one of Blockupy’s strengths – and in some respects was astounding for us too – to raise specific issues in relation to the motto as well as enact different forms of action. However, we must honestly say: we were unable to mobilize beyond the narrow activist circle. This was a problem. Since massive civil disobedience requires mass, clear goals, and a perspective for implementation, taking a stand has to be worth it. Activists know all too well whether investing their bodies is “worth it” – civil disobedience is not an end in itself. For Blockupy, Friday was only part of a total weekend of actions against the right. On Saturday, we also called for a “Borderless Block” at the demonstration from the alliance “Aufstehen gegen Rassismus.” The “Border- less Block” was by far the largest, most diverse block at the demonstration. Notwithstanding, the 6,000 par- ticipants are a sobering balance, should the demo taken as a whole be the expression of a broad mobilization against the AfD, the new and successful right wing party. The Blockupy alliance is comprised of activists from various emancipatory groups and organizations, including the Interventionistische Linke, Attac, Occupy Frankfurt, labor unions, youth and student unions, the Erwerbslosen-Forum Deutschland (forum of the unemployed) the party DIE LINKE, the Network of the Ger- man Peace Movement, and the alliance “…umsGanze”. We must recognize that this breadth is currently not represented in our organizational nexuses or on the street. Already before the September weekend in Berlin, we knew of the difficulties to integrate on a local level those groups and networks that had been active in Frankfurt. Some networks had already mentioned that their composition in Berlin was different to that in Frankfurt, and that a Blockupy foothold was missing in Berlin. This missing dynamic within the coalition re- sulted in a further narrowing and limitation to the “activist core” ultimately in the streets. Even in Frankfurt, not all circles were represented equally everywhere. The possibility of smooth transitions, however, was more likely through the “triad”3 of choreography and many things taking place aside of the actions. Berlin was mainly supported by only a few circles, the diversity and breadth of Blockupy was difficult to discern. Of course, the four years in Frankfurt did not fall into our laps. There were several years of testing, of consol- idating the alliance, of expanding – in an intensifying (European) situation that we as Blockupy placed our- selves in. In Berlin we missed the “Blockupy triad” (action, demonstration, discussion), which had actually allowed the alliance to evolve in its diversity in that the respective alliance partners could productively move forward. Berlin in September was important for the Berlin Blockupy platform, since it could establish itself and thus better arrange and install itself there. Yet, we should not omit that even our own circles were unable or just barely able to mobilize. This also reveals a problem with Blockupy as an evolved actor. “We” are already so familiar with each other, that sometimes Blockupy’s double move for political strategy gets lost: namely wanting to not only act and operate “exter- nally” as a “disobedient mosaic”, but also wanting to make this form of intervening (interventionist) politics effective and attractive in our respective currents and communities. Not all practical proposals are neces- sarily suitable, some need more time and, most importantly, there needs to be space and interest amongst ourselves to want to listen seriously from the respective dynamics. It is therefore critical in this kind of “mo- saic politics” not to interpret or presume the productivity of this trustworthy and confident collaboration in the coordination group of Blockupy to be the “levelling down” of participating links, or to overestimate the role of the “coordinating group” (the connections work differently and must do so in order to be a successful and effective mosaic). Rather it is crucial to invest in communication and to search for possibilities for mutual empowerment. It was already clear beforehand that this September weekend was a test run, an honest intention, but none- theless a first attempt to make Blockupy practical in a new context, in the political capital. Beyond this, it was our goal to intervene in the current Federal German constellation – the supremacy of a right-wing discourse. It was clear that this wasn’t and couldn’t be a Europe-wide mobilization (why should European activists from France, Italy, etc. take part in a mobilization against the right/the AfD in Germany?). Our orientation was supposed to be, however, transnational in character and we wanted to (even indirectly) contribute to the Europe struggle against the right. We must certainly stipulate that this indirect “Europe question” was barely understood as such. This might be because the “swing to the right” is reality for many years in other European countries, both in the streets and in the form of populist parties. It might also be due a political situation that there is currently no common point where the various anti-right struggles can be condensed into a “Europe- wide” question, as a question for another Europe, from below and in solidarity. For sure (but we knew this before), in contrast to last year’s anti-austerity protests, there was and is no point of culmination (yet? ), in which the various social and political conflicts can solidify and create a symbol that is meaningful for all demands and is itself a kind of convergence of struggles. Although the activists in France showed us how to create connections amongst various conflicts and how to build a left-wing counter-offen- sive within the context of a strong right-wing movement, this development remains unique on European soil. Even when the question of European inner-competition and the harmonization of labor law on a European level was posed within the Loi Travail conflicts, the conflicts – in contrast to those in Greece last year – seemed more “national” than European. It was a conscious decision to address social rights and the question of social division from above over the September weekend. The Ministry for Labor and Social Affairs and the wide-reaching demonstration from “Aufstehen gegen Rassismus” (AgR) seemed to be the right opportunity. We welcomed the founding of the alliance “Aufstehen gegen Rassismus” as well as the initial emerging dynamic. In this setting – but as an inde- pendent part – we wanted to incorporate into the conflict the question of the breeding ground for racism and the question of social rights. Why we as Blockupy were part of the AgR weekend and why we wanted to insert ourselves there wasn’t fully understood – neither by our various (Blockupy) currents and networks nor by the alliance “Aufstehen gegen Rassismus”. Our priority had been to establish and strengthen a social dynamic as an attempt to form a pro- cess of political alliance in which we reacted to a changed societal situation in Germany. We wanted to not only open the debate on racism and the AfD to “the social question,” but also to make the broad fight against the swing to the right an important topic for the Blockupy alliance. We could not convey this idea successfully. Therefore, we could not really create an attractive, convincing “offer” to the activists, neither on a textual nor on a symbolic level. Even if seeking out these connections and accepting the invitation on that weekend still seems right in retro- spect, the problems for Blockupy as an actor in alliance work nevertheless became obvious. Caution is im- perative if Blockupy is to enter another alliance as an independent actor where individual currents or organ- izations of that alliance are already present. Sometimes we were stepping on our own toes and the conflicts couldn’t necessarily be solved productively. In addition, doesn’t the “Blockupy label” perhaps sometimes have a counterproductive meaning in terms of mobilization and political possibilities? While we have to look for our own mistakes in the communication and mobilization, the question as to why no dynamic could be triggered within civil society on that weekend is certainly more gripping. There might be an “overriding problem” here; namely, that the space of a demonstration offered to the “supposedly searching civil society” is not such an attractive space. So what questions should we be asking if it still seems right to create these kinds of spaces and to raise our voices? All told, we must rate the past attempt to “move to Berlin” as dissatisfactory. There are other pitfalls to Berlin as a space than there are in Frankfurt. While Frankfurt has a city center – and the new ECB building as a symbolic luminosity is hard to beat – Berlin is a much more decentralized city. With 6,000 people – like on the morning of March 18, 2015 at the actions against the opening of the ECB – we may have been able to block the Ministry of Labor, but we wouldn’t have been able to interfere with the daily routine in Berlin, as was to some extent possible in Frankfurt. In relation to the movements and activist core, Berlin is much more ori- ented towards the diversity of its “own” projects and activism than is the case in Frankfurt. Blockupy was to a certain extent welcomed to and by Frankfurt. In Berlin, it might have also been arrogant to think that work- ing on a collective project was desired – regardless of how convincing or relevant it may seem. Blockupy understands itself and is understood by many as a Europe-wide, transnational actor and network in terms of what its attractiveness and meaning would seem to account for. However, we as Blockupy did decide against a Europe-wide mobilization in September. We wanted to take into account a political situation in the German context that demanded an intervention and hence work with local activists. An international mobilization is not an end in itself. Just because international comrades are taking part in a demonstration this does not mean it becomes an international demonstration. Conversely, just because there was no inter- national mobilization does not at all mean that there is a retreat to the “national”. Our European comrades living in Berlin for various reasons saw the “transnational meaning” of the Ministry of Labor and were there – the same goes for comrades who traveled from Poland and the Czech Republic. The European connections and commitments gained over the past years – through Blockupy International, for example – should not be “used up” for any opportunity, rather we should have a more honest exchange about the “right” collective mobilizations and approachable places with them. We are doing this in Blockupy International when we compare impressions and analysis on regional politics and mobilizations, when we talk about where there might be useful mobilizations that could solidify our protests or help consolidate our uneven politics. The G20 mobilization in July 2017 could be one of these places and processes. There could just as well be a collective mobilization to Brussels, Rome, or another place. This work with one another has not stopped – just the opposite. Nevertheless, we must speak for real about how appropriate Blockupy is as a political form and how or whether Blockupy can become relevant as a particular form. We are therefore asking ourselves generally: How can we produce agency and ability to act in times of political powerlessness and fear? Moreover, which forms of protest are currently appropriate to intervene in a European capitalism, shaped by power and dom- ination, and to break into the daily routine of “business as usual” in a form that resonates? There are, for example, strong attempts to install a kind of European IMF in 2018. This indicates that even classic themes of austerity continue to be relevant. However, even if the future of the “European crisis pro- tests” remains open and the situation in southern Europe or elsewhere could escalate at any time, it is still clear that we as the Blockupy coordinating group currently don’t see any relevant dynamic in the narrow political field of “crisis regime, austerity, ECB” that helps with consolidation and creating connections. Couldn’t, for example, the upcoming mobilizations against the G20 Summit in Hamburg, Germany in July of 2017 become a potential place where we can join our forces in our critique of dominance? Where we can search together for disobedient actions that demonstrate that breaking with rules we don’t accept invites others to join us in the deployment of our own bodies for a “democracy without capitalism”? Couldn’t we apply our transnational, Europe-wide networks here and make “Europe” a central terrain in the fight against the dominating organization of the world? Couldn’t we, in solidarity, give force again to our idea of another Europe, a democratic Europe, and a democratic world from below in the best way here? What would be the conditions and what questions must we ask to avoid making the mistake of simply “event hopping,” and to instead work collectively on our further development. How could we – and how do we want to – do this as the Blockupy (alliance)? Does this mean to take part in the G20 process AS Blockupy and play a contextual role as Blockupy; does this mean to dissolve as Blockupy into the G20 process? What would be the benefit, use, results? As the Blockupy coordinating group we have asked ourselves these questions and think that we could see the anti-G20 protests in Hamburg as the next stage towards a Europe for those at the bottom, for the introduction of social rights, and for participation for all. In our perspective and estimation, the G20 mobilization – which will be an important point of reference for non-parliamentary politics next year – offers the possibility, particularly in relation to international partic- ipation, of drawing a line of continuity from Seattle to G8 in Genoa to the World Social Forum and to G8 in Heiligendamm, and making a “European point.” Especially with an eye to the next 12 months (until the Bundestag election4), the (radical) left must seriously discuss what they can do to open a window of op- portunity. A window of opportunity that shows others and us that there are alternatives to racism and the neoliberal “lack of alternatives.” We once called that the “camp of solidarity.” Certainly not because we believe that the most important changes are brought about by elections. No, fundamental changes of the kind we’re striving for are only possible through social movements and cross-border dynamics that allow for something different – a civic, living dynamic from below. This is especially important when the discourse is reduced to the question of elections and along with it the false alternative of a neoliberal “more of the same or national isolation”. The past years have made Europe visible as the terrain of our struggles. This is even “new” in the field of globalization movements. Blockupy, as a transnational, Europe-wide project, is of great relevance here. We agree that it has been a positive result of the past years to recognize Europe as our field of struggles and conflicts. Yet, the left barely reacted to the Brexit and in this current phase, one has to look very hard for a left wing and progressive critique of the project of dominance that is the EU. Even if the past months saw more approaches from the left wing for European initiatives (like DiEM25, Plan B etc. ), a project that also reveals itself in the streets – in other words that is lined with movements – is not in sight. As tedious and difficult as this task is a truly European collaboration and within it the process towards organizing and towards a Europe from below endures and is more necessary than ever. This we see as one of the central tasks for the (radical) left in the next few years – as well as for us as Blockupy and the movements, networks and organizations within Blockupy. We want neither this EU nor a return to the national. We want a Europe of social movements. Sure, this task cannot simply be solved nationally. This is why we must answer the underlying questions internationally. That is why we are currently working to consult European movements and hubs and to experiment with forms of organizing. It is also clear that the way should not be to go into the G20 platform as “Blockupy as actor”. This would only lead to unproductive confusions and complications, like that which we experienced over the September weekend. Instead of joining “another alliance,” we are calling on all Blockupy activists to enter into the G20 process locally, nationally, and Europe-wide as fighters for social rights for all and for a Europe from below, as participants in a disobedient mosaic against institutions, the EU, and the German (or our national) govern- ment. We should neither overestimate ourselves nor underestimate our experience from the past 5 years. We think the G20 mobilization is the chance for us to productively apply our experiences, networks, and con- tent. Let us move to another stage. Moreover, let us not understand this as “dissolution into the G20” or “event hopping”. Rather let us declare that we will assemble next summer after the G20 Summit as a na- tional and Europe-wide network in order to evaluate this “stage” and to decide together where we stand as a European mosaic. Regardless of how we will evaluate the G20 and what role it could play for us, we will be able to account for the experiences and difficulties from our mutual practice, even in the future. Let us thus attempt to bring about a globalization critique 2.0, an alter-globalization movement of new sorts. Let’s create space for a Europe of struggles, that is currently fragmented, but in which it can become visible again and in which the experiences gained during the last years of struggles can converge. 2 „Black Zero“ is a (German) budgetary term, meaning, that there should be no making of a deficit in the budget. Symbolically it stands in for a good (neoliberal) budget.